Teaching composition the “Charlotte Mason way” is not formally teaching it at all. Rather, it is relying upon her methods, including the reading of great literature, then having students provide various types of narrations and dictation. The reference from Volume 6 pertaining to this topic is here. To learn more and see how “Charlotte Mason composition” looks in various homeschooling households, read on! A special thank you to all those who sent in blog posts, as this is probably one of the busiest times of the year for homeschool moms! Our first post is from Tammy, from her blog AUT-2B-Home in Carolina, and is entitled Composition with an Eye Toward Development. Tammy provides not only samples of her daughter’s written narrations along with Tammy’s wise analysis, but has several quite informative links for anyone wishing to read more about the benefits of narration and other Charlotte Mason methods of teaching. Although many of us use a modified Charlotte Method approach toward teaching composition, Lindafay provides a bonanza in her two posts on this topic, encouraging homeschool parents to stay the course and rely only upon Charlotte Mason’s methodology in order to have students who become excellent writers. You Don’t Need a Composition Program and How I Raised a Writer Without a Composition Program share how to employ Charlotte Mason’s methodology from Kindergarten through high school, from her blog, Higher Up and Further In. Inspiring! Continuing in our discussion on composition, in our next post Carol reminds us that part of the equation for learning how to write is reading living books. She shares a book review in her post, Shakespeare’s Theatre, complete with illustrations and quotes from this jewel, at her blog journey-and-destination. Along the same lines, another highly recommended living book no homeschool should be without is described in my post, King Alfred’s English: a History of the Language we Speak: a Must Read!. This fascinating book is perfect for a family read-aloud, history book, copy work and more, from Train up a Child Publishing Blog. Like reading great literature, a hallmark of learning to write is regular oral and written narration. I’m still chuckling from Brandy’s post providing the benefits of and helpful teaching tips On Group Narration, at her blog, Afterthoughts. Our next two contributor’s share their posts pertaining to nature study. Describing the sometimes difficult balance between “letting alone” and “controlling authority,” Shirley-Ann inspires us with her post, A Wise Letting Alone, pertaining to her family’s nature study, from her blog Under an English Sky. Phyllis grants us a peek into her planning their homeschool’s nature study this year in her post School Planning: Nature Study on her blog, Hunsucker’s Home, as well as sharing a past post (with cute photos!) called Nature Study: Mammals. Patti’s charming post Art, Music and Poetry offers delightful examples of paintings, poetry and links to classical music pieces on her blog All Things Bright and Beautiful. Here at the beginning of school for many, Nancy from Sage Parnassus offers wise counsel to focus on the relationships we desire our children to develop with what they are learning, rather than allowing the “nifty extras” to actually be a distraction to that relationship, in her post Love Affairs in Education or The Thing is The Thing. Celeste is already half-way through her first term! And school is well-underway, even though she has a houseful of little ones. Celeste has a well-organized plan for second grade, which she shares with us in her post Second Grade in Our Home: An Overview , from her Joyous Lessons blog. (I never met a chart I didn’t love!) Thank you, Celeste! Thank you again for taking the time to participate! Apologies in advance if there is a post I missed; please contact me at dana@trainupachildpub.com and I either will add it or send it on for the next carnival, at your request. According to the Carnival Schedule, the next carnival will be the “Back to School” edition focusing on CM Planning and Organization! 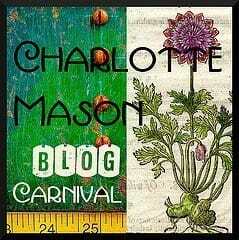 Please submit posts to the following e-mail address: charlottemasonblogs (at) gmail.com. Thanks for contributing your post, Shirley-Ann. It is some good reading this time – actually every time. I love the homeschooling community! I really liked the sound of the King Alfred’s English book, but it’s not available in the UK except by shipping internationally (ouch!). Anyone else in the same boat as I am, you could try “Say What?” ISBN 978-0887768781. That really doesn’t seem fair that it is not available in the UK! 🙂 I wonder if it available on Kindle… Thanks for visiting and taking the time to comment. Thanks for putting together this carnival Dana. I can’t wait for a quiet moment armed with a good cup of tea and all this lovely reading! I second Beth’s comment; a lovely layout & structure to what you’ve written, with thoughtful commentary. Thanks Dana. Love how you organized this blog carnival, Dana. It would make a great introduction and overview for moms to just learning about Charlotte Mason methods. Thanks for taking the time to do a blog carnival at this busy time of year!